Trailing Blackberry( Rubus ursinus) -– Works at the subconscious, emotional and throat chakra levels to shift beliefs and energy patterns that keep you from joyfully speaking your truth and power. I AM reaching out to joyfully express my truth and power. Trailing Blackberry is a US Pacific Northwest leggy native groundcover that is easy to trip over and catch on your clothes as you walk through the woods. Its flowers have 6 narrow white petals, and it produces small oblong blackberries. The berries were a main food staple of many indigenous peoples. Leaves and roots were used to treat diarrhea, dysentery, excessive menstruation, fevers, and sore in the mouth. Having difficulty expressing what you think or feel. Often this is related to beliefs that what you have to say isn’t valuable, helpful or good enough. Physical symptoms may include throat, thyroid or shoulder issues, or poor communication between the central and peripheral nerves in the shoulders and arms. Trailing Blackberry Flower Essence assists you to direct your intention to shift subconscious beliefs and energy patterns that control how you think, feel and express yourself through speaking. It does this by working from the subconscious, emotional and throat chakra energetic levels to support the cognitive functions that form speech. 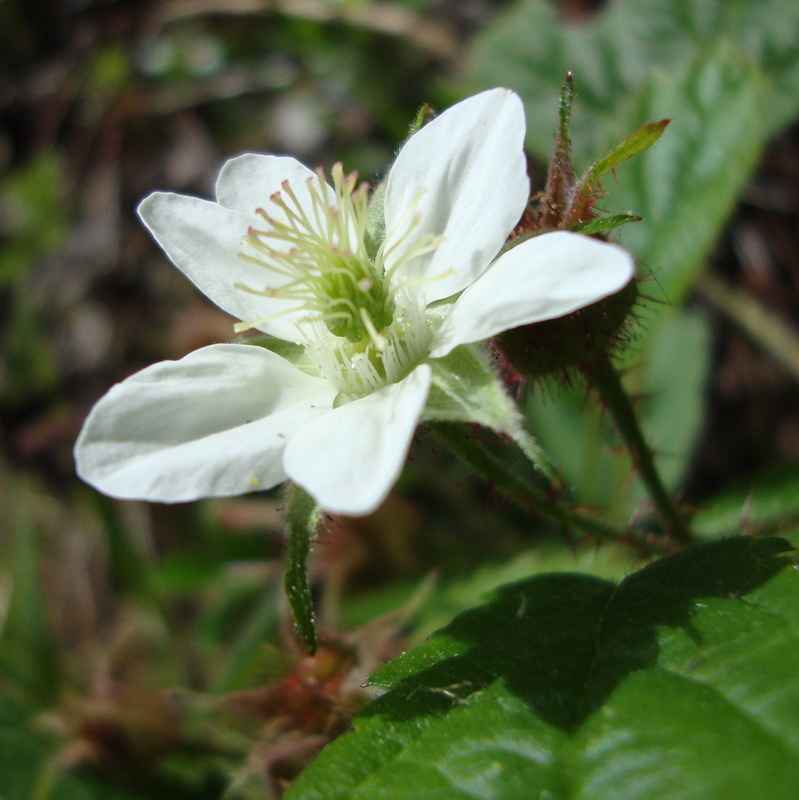 Trailing Blackberry Flower Essence also aligns the pathways in the etheric body that support, balance, and stabilize the interplay between the central nervous system and peripheral nerves in the shoulders and arms. Together these support you to reach out and express your truth and power. Trailing Blackberry Flower Essence was made with the “no-pick” method of bringing the frequency of the plant spirit directly into the mother/storage bottles as they are sitting with the plant. During this process, amber, blue topaz, bloodstone, drusy quartz, icosahedron cut quartz, iolite, labradorite, lapis, ocean jasper and sodalite crystals were placed among the plants with the storage (mother) bottles. The sun acts as a transformer to step down spiritual energies from higher dimensions. While the essence was being made, Amber acted as a lens to receive and focus sunlight for this purpose. It also aligns the subtle bodies with the physical bodies, transmutes negative energy into positive energy, and emits a sunny and soothing energy that calms and enlivens the disposition. Blue Topaz helps you discern what you want, be clear about your aspirations and speak your feelings. It calms the emotional body and holds the clear resonant pattern of the human body and energy systems. Bloodstone is an intense healing stone that helps to balance your body while your energy fields realign. It also facilitates admittance to the spiritual realms of the ancestors. Drusy quartz crystals help to energize and stabilize your subtle bodies. Icosahedron Cut Quartz has 20 (5X4) equilateral sides. It is a bridge between the 5th Dimension - the entry into the unified Spiritual realms - and the 4 cardinal directions (N, S, E, W) on Earth. Iolite relates to both the throat and 3rd eye chakras, and helps you to speak what you perceive. It encourages a calm, clear and positive mind. Labradorite helps you to uncover subconscious beliefs, self-talk and emotional patterns that may lead to “mystery illnesses.” It shifts your attention from focusing on the illness toward aligning with healing thoughts and prayers. Lapis brings truthfulness, openness, inner power, intuition, and spiritual love while being more organized in your daily life. It is associated with the throat and 3rd eye chakras. Ocean Jasper is calming and protective. It heals emotions, lifts your mood, and brings joy and peace. Sodalite helps you to shift from experiencing your world through worry, anxiety and stress and instead to envision your life from a more serene perspective. The actions of the crystals inform the way this flower essence seats into the body/mind. While the Trailing Blackberry Flower Essence was being made, imprints of rattle and blue jay feathers were infused into the essence.